It’s that time of year again. Time for us to make a list of Resolutions that we will probably forget about by February. But since many of us are making resolutions, then let us join the fun through this giveaway. I was given the opportunity to join this group giveaway. So, grab your chance to win too! 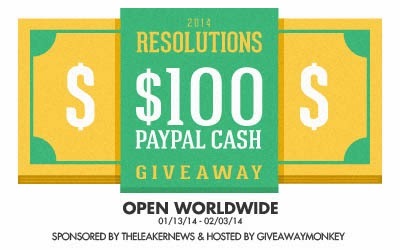 One (1) lucky reader will win $100 Paypal Cash. This giveaway is open worldwide and ends on February 03, 2014 EST. To enter, simply use the following Rafflecopter form. Good luck! One winner will be chosen at random via Rafflecopter. The winner will be sent an email and will have forty-eight hours to respond. If no response is received within forty-eight hours, another winner will be chosen. Giveaway Monkey and other participating blogs are not responsible for prize fulfillment. How do you get to lead a giveaway on your blog? I have seen many and have entered in many...but how do you host them?